Overseas Filipino workers (OFW) groups and advocates today hailed the court decision disallowing the implementation of the Manila International Airport Authority’s (MIAA) plan to integrate airport terminal fee in airline tickets for international passengers. The group which called themselves as #NoTo550 Coalition said the decision of Pasay Regional Trial Court (RTC) is a victory that will have a far-reaching implication on millions of overseas Filipino workers (OFWs). “We are happy at the court’s decision on the issue of airport terminal fee integration. It is definitely a victory not only for us but also, most importantly, for the millions of hardworking Filipino workers abroad,” the group said. Last Wednesday, the Pasay RTC ruled on the petition filed by #NoTo550 Coalition questioning the implementation of the MIAA Memorandum Circular No. 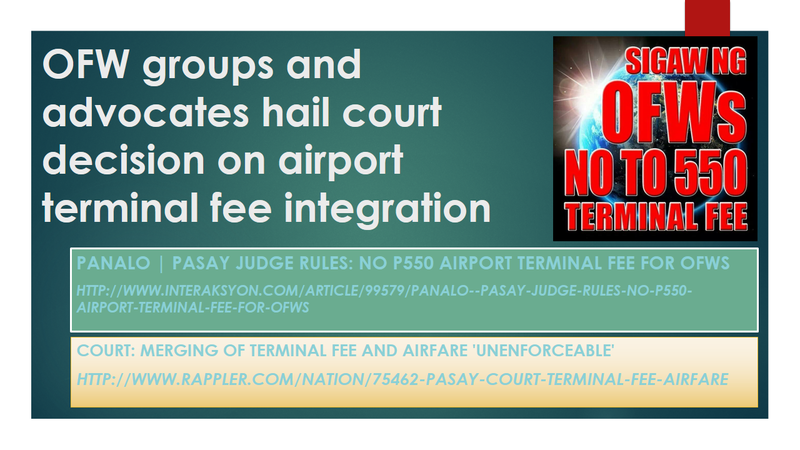 8 which seeks to integrate airport terminal fee amounting to P550 in airline ticket for international passengers. The Court found the MIAA MC No. 8 as “unenforceable” because the agency has failed to publish the official copy of the memorandum as required by Article 2 of the Civil Code and Executive Order No. 292. In his ruling, Pasay RTC Presiding Judge Tingaraan Guiling noted that MIAA has shown “no proof of publication in the Official Gazette nor in any newspaper of general circulation” and therefore, is deemed “unenforceable”. The group however said that this initial victory is more than an encouragement for all OFWs to step up the fight against the MIAA MC No. 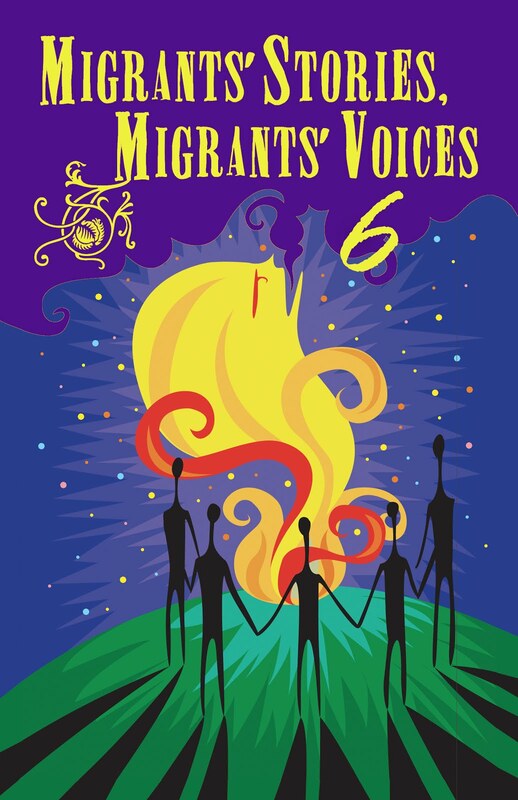 8 which, it maintained, undermines the integrity of the intent and spirit of the 1995 Migrant Workers Act, and as amended by RA 10022, which defines and safeguards our overseas workers’ rights. According to them, they will continue to seek redress before the two houses of Congress until the MIAA finally abandons the implementation of its memorandum order that blatantly ignores the exemption from paying terminal fee among others as granted by law to all OFWs. “Our work is not yet done. We will continue to bring our case to Congress that made the law exempting our Filipino workers abroad from paying terminal fee. We still hold a firm belief that a mere circular violates the 1995 Migrant Workers Act,” the group said. Members of #Noto550 Coalition include OFW Family Partylist Rep. Roy Seneres, Ma. Susan “Toots” Ople of the Blas F. Ople Policy Center and Training Institute, Gemma Comiso of PinoyExpats/OFW Blog Awards, Engrs. Nelson Ramirez and Bienvenido Lorque of United Filipino Seafarers, Carmelita Nuqui of Philippine Migrants’ Rights Watch, Ellene Sana of Center for Migrant Advocacy, Loreto Soriano of the LBS Recruitment, Elso Cabangon and Rashid Fabricante of Filipino Migrant Workers Group, Sis. Teresa Evasco of Daughters of Charity Migrants Desk, Luther Calderon of KAMPI, Ma. Fe Nicodemus of KAKAMMPI, Patrick Itao and Abby Platero of the Office of Senator Cynthia A. Villar, Edward Era of Filipino Lifeline, Federation of Associations of Manpower Exporters and Ang Bagong Bayani OFW Labor Party. Both Sen. Koko Pimentel and OFW Family Partylist Rep. Roy Seneres have earlier filed separate resolutions calling for an immediate investigation into the MIAA MC No. 8. The House committee on overseas workers affairs has scheduled on Monday, 9:30 AM to hear the issue.